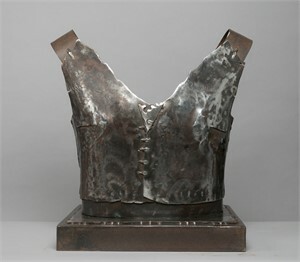 Donna McCullough‘s Garden Girls and Drill Team series, which is created of aluminum mesh, and steel dress forms, coaxes the audience to re-examine their perceptions of the cultural icons, gender stereotypes and the nature of these unyielding metals. Intrigued by the dichotomy between perception and reality, her medium becomes symbolic, where the qualities of metal define not just itself but the object it eventually is molded to become. McCullough employs a juxtaposition of extremes: such as lightness and gravity, suppleness, and intransigence, to convey feminine sensibilities. Her work explores the duplicitous nature of steel or mesh, which can be manipulated to appear feminine and soft while maintaining its strength and rigidity – as a result, the dresses are at once both elegant and imposing. Synchrony Presents: A Shift in Ambition from T Brand Studio on Vimeo. Could there be a perfect symbol of modern America than the oil can? The oil can captures the essence of that country in a single object. It conjures up images of the car industry providing entire town employment, import and export, and private car ownership. The oil can embodies the mixed message of consumerism versus the open road of the early pioneers and the advertising industry, with its logos and graphics, competition and power, conspicuous consumption and flagrant waste. 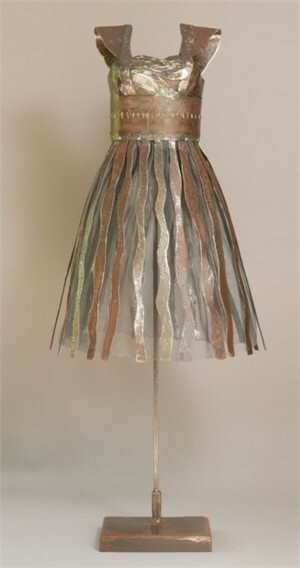 These dresses demonstrate their transition, from the functional to the fabulous, from the Industrial to sculptural. 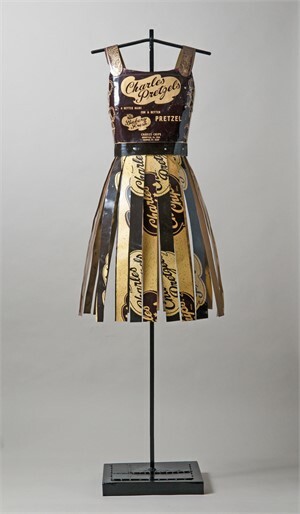 By deliberately leaving the iconography of the oil can intact, this dress is a consumer icon, it recognizably retains its original identity although it now exists in a new form. McCullough refers to her series as, “The Drill Team”, a phrase which at a stroke conjures up a number of diametrically opposed images. The name has overtly masculine overtones; heroic, idealized men and machinery exuding power, danger and the exploration of unknown territories in hidden depths. But it also references the Drill Team of the cheerleaders who decorate the peripheries of that great, inherently masculine institution; the American Football game with displays of colorful choreographed athleticism, noted solely for their twirling of pom-poms and blatant femininity. Given that the style of these dresses references that of the cheerleader, by implication this references the sponsoring of televised sporting events by large business corporations, including the oil companies. The implication is that everything is destined for the mass market; everything carries a subliminal message, nothing is pure, everything is manufactured and offered for consumption. Is this a metaphor for life in modern, consumerist America? 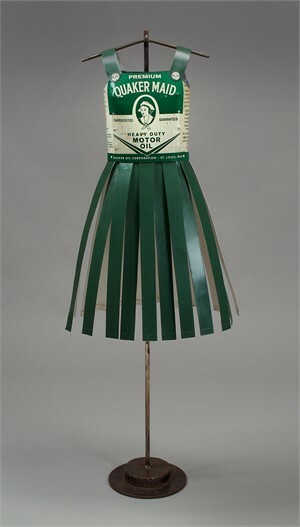 McCullough’s dresses subvert this macho symbol beautifully, by converting the oil can into a dress; she at once emasculates it and creates the most feminine of objects. The value to be found in Donna McCullough’s work is in her development of a genre that although technically less than a century old, can trace its origins through the history of art. 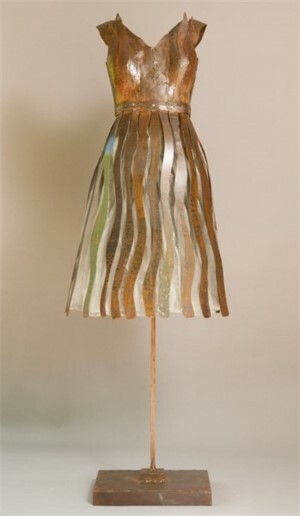 Donna McCullough‘s Garden Girls and Drill Team series, which is created of aluminum mesh, and steel dress forms, coaxes the audience to re-examine their perceptions of the cultural icons, gender stereotypes and the nature of these unyielding metals. 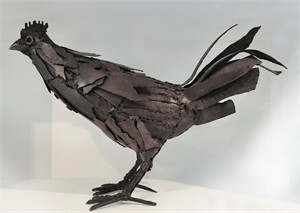 Intrigued by the dichotomy between perception and reality, her medium becomes symbolic, where the qualities of metal define not just itself but the object it eventually is molded to become. McCullough employs a juxtaposition of extremes: such as lightness and gravity, suppleness, and intransigence, to convey feminine sensibilities. Her work explores the duplicitous nature of steel or mesh, which can be manipulated to appear feminine and soft while maintaining its strength and rigidity – as a result, the dresses are at once both elegant and imposing. “Fashion is well known as a reliable reflection of cultural trends and historical events. On a personal level, it has become my creative vehicle for exploring the emotional roller coaster of life. My inspiration arose from contemplating the dichotomy between the perception of women as fragile, delicate creatures, and the reality that most women are defined by resiliency and steely resolve. I like the duplicitous nature of steel which can be manipulated to appear feminine and soft while actually maintaining its strength and rigidity—an expression in contrasts and complements.” -Donna McCullough Synchrony Presents: A Shift in Ambition from T Brand Studio on Vimeo. Excerpt from Donna and The Drill Team – An Interview with Donna McCullough by Michael Stewart Could there be a perfect symbol of modern America than the oil can? The oil can captures the essence of that country in a single object. It conjures up images of the car industry providing entire town employment, import and export, and private car ownership. The oil can embodies the mixed message of consumerism versus the open road of the early pioneers and the advertising industry, with its logos and graphics, competition and power, conspicuous consumption and flagrant waste. 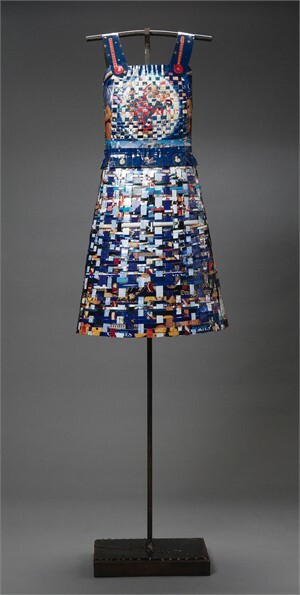 These dresses demonstrate their transition, from the functional to the fabulous, from the Industrial to sculptural. 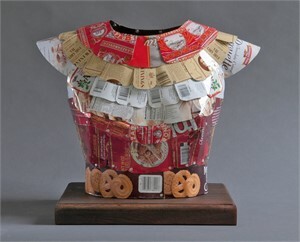 By deliberately leaving the iconography of the oil can intact, this dress is a consumer icon, it recognizably retains its original identity although it now exists in a new form. McCullough refers to her series as, “The Drill Team”, a phrase which at a stroke conjures up a number of diametrically opposed images. The name has overtly masculine overtones; heroic, idealized men and machinery exuding power, danger and the exploration of unknown territories in hidden depths. But it also references the Drill Team of the cheerleaders who decorate the peripheries of that great, inherently masculine institution; the American Football game with displays of colorful choreographed athleticism, noted solely for their twirling of pom-poms and blatant femininity. 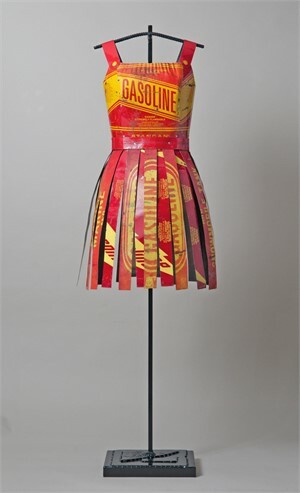 Given that the style of these dresses references that of the cheerleader, by implication this references the sponsoring of televised sporting events by large business corporations, including the oil companies. The implication is that everything is destined for the mass market; everything carries a subliminal message, nothing is pure, everything is manufactured and offered for consumption. Is this a metaphor for life in modern, consumerist America? 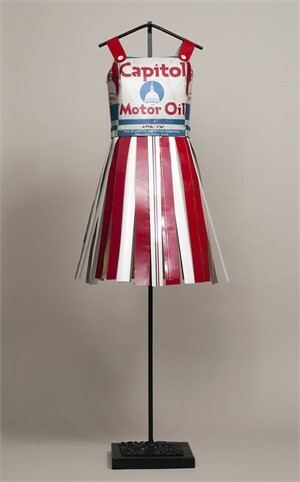 McCullough’s dresses subvert this macho symbol beautifully, by converting the oil can into a dress; she at once emasculates it and creates the most feminine of objects. The value to be found in Donna McCullough’s work is in her development of a genre that although technically less than a century old, can trace its origins through the history of art.